Encompassing all Port Douglas has to offer, Mantra Aqueous on Port is the ideal location for couples, families & honeymooners. Situated in the heart of the village centre of Port Douglas lies one of the most fashionable resort destination in Tropical North Queensland. You can take advantage of the five star restaurants, designer boutiques, family eateries and a range of bars and cafes. With a contemporary design featuring an aquatic flavor, most apartments feature pool views, spa baths and balconies. 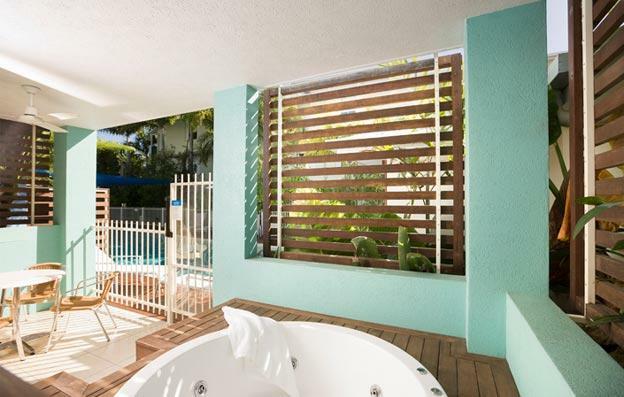 The resort boasts 4 stunning pools, sundecks and cabanas with barbeques so guests can enjoy the warm tropical climate of the exclusive beachside town, Port Douglas. All rooms at Mantra Aqueous on Port, feature a spacious balcony with outdoor spa, air-conditioning, ceiling fans, internet access and tea and coffee making facilities. Offering hotel rooms, one and two bedroom apartment with fully equipped kitchens and laundry facilities. You can chose from either the Standard, Deluxe or Swim-up option. The Deluxe option features extra large rooms, while the Swim-Up rooms feature a swim-up pool deck with direct pool access. At Mantra Aqueous on Port you can do as little or as much as you like. Wander the quiet streets and sample some of the culinary delights or simply relax on your balcony while you watch the world go by.